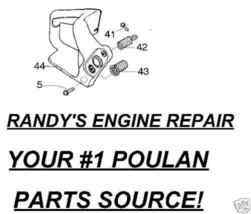 About Randy's Engine Repair RandysEngineRepair Randy Duncan's listings "I pride myself with the Customer Service we Provide!" Phone: (937) 927-5665 or (937) 927-5429 (Monday - Friday 8 am - 4 pm Eastern time) TODAY'S ITEMS ARE BEING PULLED FROM OUR HUGE INVENTORY THAT HAS GROWN OVER THE PAST 25 YEARS! 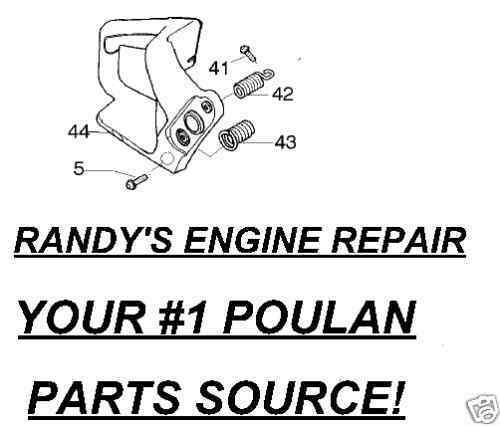 STOCKING DEALER FOR MANY OF THE BIGGEST NAMES IN THE POWER EQUIPMENT BUSINESS WE ARE THE "GO TO" PLACE FOR PARTS! EXPERIENCE YOU CAN TRUST! ANY QUESTIONS? CHECK OUT MY STORE OR CALL RANDY OR KRISTAL DUNCAN AT 937-927-5665. I'LL DO ALL I CAN TO FIND YOU WHAT YOU'D LIKE TO SEE LISTED!! 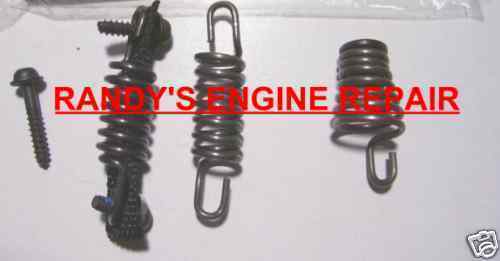 One new Poulan, Sears, Craftsman chainsaw isolator spring kit refer to part number 530049800, 530071958 and/or 545006036. Used on the following models: · PP220 Gas Chain Saw Type 1-- Handle, Chassis Bar Assembly · PP220 Gas Chain Saw Type 2-- Handle, Chassis Bar Assembly · PP220 Gas Chain Saw Type 3-- Handle, Chassis Bar Assembly · 2550LE Gas Saw Type 1-- Handle, Chassis Bar Assembly Type 1 · PP260 Gas Saw Type 1-- Handle, Chassis Bar Assembly Type 1,2,3 · PP260 Gas Saw Type 2-- Handle, Chassis Bar Assembly Type 1,2,3 · PP260 Gas Saw Type 3-- Handle, Chassis Bar Assembly Type 1,2,3 · PP260LE Gas Saw Type 1-- Handle,Chassis Bar Assembly · 2250 Gas Saw Type 1-- Handle, Chassis Bar Assembly Type 1-4 · 2250 Gas Saw Type 2-- Handle, Chassis Bar Assembly Type 1-4 · 2250 Gas Saw Type 3-- Handle, Chassis Bar Assembly Type 1-4 · 2250 Gas Saw Type 4-- Handle, Chassis Bar Assembly Type 1-4 · 2250 Gas Saw Type 5-- Handle, Chassis Bar Assembly Type 5 · 2250 Gas Saw Type 6-- Handle, Chassis Bar Assembly Type 6 · 2450 Gas Saw Type 1-- Handle, Chassis Bar Assembly Type 1-4 · 2450 Gas Saw Type 2-- Handle, Chassis Bar Assembly Type 1-4 · 2450 Gas Saw Type 3-- Handle, Chassis Bar Assembly Type 1-4 · 2450 Gas Saw Type 4-- Handle, Chassis Bar Assembly Type 1-4 · 2450 Gas Saw Type 5-- Handle, Chassis Bar Assembly Type 5 · 2450 Gas Saw Type 6-- Handle, Chassis Bar Assembly Type 6 · 2550 Gas Saw Type 1-- Handle, Chassis Bar Assembly Type 1-4 · 2550 Gas Saw Type 2-- Handle, Chassis Bar Assembly Type 1-4 · 2550 Gas Saw Type 3-- Handle, Chassis Bar Assembly Type 1-4 · 2550 Gas Saw Type 4-- Handle, Chassis Bar Assembly Type 1-4 · 2550 Gas Saw Type 5-- Handle, Chassis Bar Assembly Type 5 · 2550 Gas Saw Type 6-- Handle, Chassis Bar Assembly Type 6 · 2550SE Gas Saw Type 1-- Chassis Handle Assembly Type 1 · PP260 Gas Saw Type 4-- Handle, Chassis Bar Assembly Type 4,5 · PP260 Gas Saw Type 5-- Handle, Chassis Bar Assembly Type 4,5 · PP220 Gas Chain Saw Type 4-- Handle, Chassis Bar Assembly · 2250LE Gas Saw Type 1-- Handle, Chassis Bar Assembly · PP221 Gas Chain Saw Type 1-- Chassis Handle Assembly Type 1-3 · PP221 Gas Chain Saw Type 2-- Chassis Handle Assembly Type 1-3 · PP221 Gas Chain Saw Type 3-- Chassis Handle Assembly Type 1-3 · PP221 Gas Chain Saw Type 4-- Chassis Handle Assembly Type 4 · PP221LE Gas Chain Saw Type 2-- Handle, Chassis Bar Assembly · PP221LE Gas Chain Saw Type 1-- Handle, Chassis Bar Assembly · 2250 Gas Saw Type 7-- Handle, Chassis Bar Assembly Type 7 · 2450 Gas Saw Type 7-- Handle, Chassis Bar Assembly Type 7 · 2550 Gas Saw Type 7-- Handle, Chassis Bar Assembly Type 7 · 2550LE Gas Saw Type 2-- Handle, Chassis Bar Assembly Type 2 · 2550SE Gas Saw Type 2-- Chassis Handle Assembly Type 2 · PP260 Gas Saw Type 6-- Handle, Chassis Bar Assembly Type 6 · SM4018 Gas Saw-- Chassis Handle Assembly · BH2660 Poulan Pro Gas Saw-- Handle, Chassis Bar Assembly · PP220 Gas Chain Saw Type 5-- Handle, Chassis Bar Assembly · PP220LE Gas Saw-- Handle, Chassis Bar Assembly · Titanium 2550T Gas Saw-- Handle, Chassis Bar Assembly · 2250LE Gas Saw Type 2-- Handle, Chassis Bar Assembly · 2555 FLW Limited Edition-- Handle, Chassis, And Bar Assembly · PP260LE Gas Saw Type 2-- Handle,Chassis Bar Assembly (PART LOCATION = BIN #276) ANY QUESTIONS, FEEL FREE TO CALL RANDY DUNCAN AT 937-927-5665. I AM THE GO TO GUY FOR PARTS, REPAIRS RESTORATIONS! A GREAT GIFT IDEA! AUCTIONS Always easy worldwide shipping! International Airmail Shipping Available for extra Fees. Ohio Residents add 7% sales tax Randy Duncan PO Box 393 Mowrystown, Ohio 45155-0393 Phone: (937) 927-5665 On Apr-12-08 at 16:38:08 PDT, seller added the following information: On Apr-12-08 at 18:09:28 PDT, seller added the following information: Click Here. Double your traffic. Get Vendio Gallery - Now FREE! On Jun-09-08 at 16:40:57 PDT, seller added the following information: Use the FREE Counters 1 million sellers do - Vendio! Powered by Turbo Lister The free listing tool. List your items fast and easy and manage your active items.